Nessibu, 23, is out of reach because he boarded a flight to his native Ethi­o­pia, just before police closed in on him, the victims’ families say. The families say he’s now the subject of an international tug of war: The United States wants him returned to stand trial, but Ethi­o­pia refuses because it bars the extradition of its own citizens. Nessibu’s case is among dozens in which citizens of foreign countries have allegedly committed crimes in the United States and then sought refuge in their homelands. The United States will extradite its nationals, but a number of countries, including Brazil, Germany and China refuse to turn over their citizens to face charges abroad, even in murder cases. Simeneh said his family has been in direct talks with the Ethio­pian embassy in recent days about possible solutions and he is cautiously optimistic something might be worked out. The Ethio­pian Embassy in D.C. did not respond to requests for comment. The families of the victims agreed to speak about the killings in the hopes that publicity will help bring about a resolution. At the very least, they want to make Nessibu’s life in the Ethio­pian capital of Addis Ababa less comfortable. Still wearing her crossing guard belt after arriving home from elementary school on a recent afternoon, Christina described how Kedest walked through the door of the family’s Springfield home shortly before 7 p.m. on Dec. 22, 2016. She was with three people. One was the man who would allegedly end her life. At the time, Kedest was working in health care and had attended Northern Virginia Community College. Her family said she did not appear to be in any kind of trouble. Instead, they remember a young woman who was quick to give hugs, funny and generous. They recalled that Kedest once came across a homeless woman and her kids begging one day and took the family out to eat at Panda Express. After leaving home on Dec. 22, Kedest’s family said she and the men headed to Henock’s house. According to a search warrant filed in the case, Simeneh posted a video on social media, showing the car ride. When the group arrived at Henock’s home on Blarney Stone Court in Burke, Nessibu and Kedest went inside, while the other men waited in the car, Kedest’s family said one or more of the other men told detectives. Waiting inside was Henock, who had been a soccer star at West Springfield High School, before winning a sports scholarship to attend Virginia’s University of Mary Washington in 2012, his family said. A second search warrant filed by Fairfax County police said a family member told detectives that Henock had a history of dealing drugs, mostly marijuana. Family members said in an interview that detectives told them the meeting on the evening of Dec. 22 was arranged so Nessibu could purchase drugs from Henock. But the deal went awry somehow. Henock’s family said he was shot in the neck and head as he lay on the floor in the home. The second search warrant said police found a backpack that contained what they believed was marijuana and a scale at the scene. Kedest’s family said Nessibu ushered her out of the house, according to witness accounts given to police. Nessibu then allegedly forced the men with him to drive to a residential neighborhood a little more than two miles away in Burke. It was there that Kedest’s family said police told them she was shot execution-style in the backyard of a home on Cordwood Court around 8 p.m. A neighbor found her body the next morning. 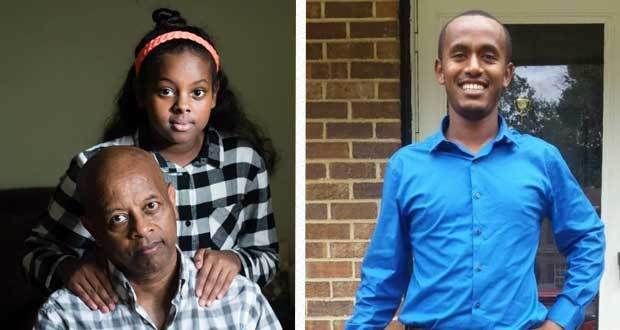 Kedest’s family said detectives told them Nessibu paid about $3,000 in cash for a one-way plane ticket from Dulles International Airport to Addis Ababa, leaving the same day Kedest’s body was found. By March, prosecutors felt they had enough evidence to pursue charges. A Fairfax County grand jury indicted Nessibu for murder and a weapons charge in both killings. Prosecutors began efforts to have Nessibu returned to the United States. In a typical extradition, prosecutors work with the Department of Justice and State Department to formally request a suspect’s return to the United States. The United States maintains extradition treaties with more than 100 countries that govern the process, which can take months or even years. The families said prosecutors hit a roadblock in Nessibu’s case, because the United States does not have an extradition treaty with Ethi­o­pia and the country bars the extradition of its citizens. The families said Ethi­o­pian officials offered to try Nessibu in that country’s courts, but they balked saying they doubt it would be a fair trial. Similar issues with extradition have played a role in other high-profile cases. In 1997, Samuel Sheinbein, then 17, and a friend killed and gruesomely dismembered a fellow high school student in Montgomery County, Md. Sheinbein fled to Israel, where he claimed Israeli citizenship. The United States sought Sheinbein’s extradition, but the Israeli courts blocked it, saying the nation’s law at the time banned the extradition of its citizens. The move caused an international row and eventually led Israel to change its law.